No one begins their private practice with the hope of being mired in administration. Yet, more than ever, practitioners are suffering through regulatory challenges and added costs associated with compliance. 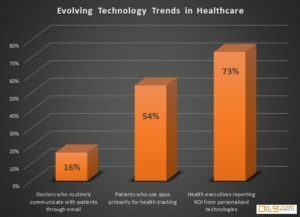 Electronic health records or electronic medical records (EHR/EMR) rules intended to facilitate the electronic exchange of health information seem to represents a major hurdle for many private practices constrained by costs. Providing the best care to patients and improving service yields high returns in satisfaction ratings plus a return to profitability. Patients are evaluating and reporting on the quality of care they receive. New health grades and regulatory fines for repeat hospitalizations mark a growing trend across the in healthcare spectrum, forcing providers to adopt better patient-centered care practices. Having access to the right data, for a comprehensive whole-person view, is vital for a personalized experience that helps improve outcomes. It is a return to what is most important: the doctor-patient relationship. Replacing disparate and fragmented computer systems by gathering data into a single location, accessible by staff when needed, is a critical first step. This the basic concept of Cloud computing, a resource that provides ultimate flexibility by connecting through various devices and managing multiple file types. Accessing and unlocking critical data enables clinicians to reach patients on a person level, wherever and whenever they need quality care. Storing data in a secure, reliable and privately hosted environment provides an easily managed solution that resolves the fiscal constraints while providing the infrastructure, platform and software that’s required to fully support and optimize EHR/EMR. What’s more, hosted Cloud options price out at nearly 50% less than traditional on premise data management solutions. That system, coupled with a hosted VoIP/PBX system represents the best in virtualized communications and efficient operations. Reception staff can immediately see who is calling and know if an extension is in use before transferring calls. Call recording can easily be transferred for transcription and staff can be accessible no matter where they are with access to clinical data when they need it. What’s more, all critical, private information is stored securely and backed-up in real time for disaster recovery protection. Putting it all together requires the help of a true IT partner, one that can see the big picture and help your practice integrate seamlessly. Choose a provider not by a recognizable logo, but by solid experience, a record of innovation and one that will treat your practice like their only customer. This means a service-first provider with local service options and a strong commitment to personalized attention, a true partner for the long haul. Healthcare providers who fail to embrace true virtualized communications and cloud based technology already adopted by their industry are setting themselves up for a future downward spiral. Without access to the efficiencies inherent in private Cloud storage and true integrated communications, they limit their ability to remain competitive and independent. Finding the right IT partner helps ensure continued independence and a chance to get back to helping patients in a meaningful way.